The Rotary Club of Brantford has a long history of raising funds for community causes that desperately need the financial support. Focusing on the needs of children, Rotary’s assistance has had a significant impact on the development on some of this community’s strongest youth support programs. One of those support programs has been the Boys’ and Girls’ Club of Brantford. The support of this program, from day one, has created a positive environment that has helped thousands of youth in our community. The Rotary Club of Brantford founded the Boys’ Club in December of 1969, when a group of individuals believed that our community needed a place for boys to grow, and to find some structure. Although the Boys’ Club of Brantford opened in December of 1969, Lt. Governor W. Ross MacDonald officially opened the Club located in a church basement at 112 Darling Street, on Friday March 13th, 1970. Both the clubhouse, and initial operating funds for the project, were provided by the Rotary Club of Brantford. In its first year of operation the Club had a membership of 406 boys. Due to a growing membership and the need for additional space, a building at 121 Darling Street was purchased in 1972. This would be a clubhouse for the next 17 years. Also in 1972, one headline in the Brantford Expositor read Another Masculine Bastion is Broken, following the announcement that programs for girls were now being incorporated, one night per week. This was also the year when one of the longest running programs of the Club was introduced, boxing. This program produced many talented athletes, including a member who held the Ontario Junior Featherweight title and went on to win the Canadian Junior Amateur title. 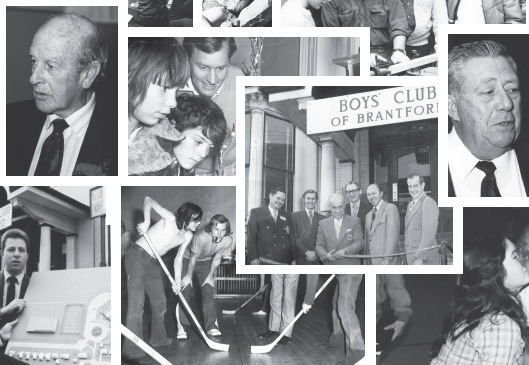 In 1975, the club officially changed its name to the Boys’ & Girls’ Club of Brantford and programs for both boys and girls were fully integrated. At a Club function in 1979, W.D.H. Gardiner, Vice-Chairman of the Royal Bank of Canada, said the Rotary Club of Brantford “has played a key role in setting the stage for the Brantford Boys’ & Girls’ Club success.” This statement rang true as a new gymnasium was added to the facility in the same year. In 1985 Kiddy Korner Preschool, providing half day programs for preschoolers, was also added. Around 1986, the Club was quickly running out of space to accommodate the growing membership and programs, and the Board of Directors began the task of developing a capital campaign for the construction of a new facility. Once again, the Rotary Club of Brantford was instrumental in the success of this project, assisting the Club in many ways including raising funds through three home draws. In September of 1989, the Boys’ & Girls’ Club and the Rotary Club of Brantford celebrated the official opening of The Rotary Centre – Community, Youth & Fitness. The new 35,000 square foot facility provided expanded services to the community, the preschool program grew into a full daycare programs, adult and senior fitness and wellness programs were developed and our youth members reaped the benefits of a new facility for their recreation and leisure needs. The current building was named The Rotary Centre as a tribute to the Rotary Club of Brantford for founding and continuing to support the Boys’ & Girls’ Club. The Boys’ and Girls’ Club of Brantford has come a long way since its humble beginnings. Ellins and Campbell were both instrumental in opening the club, and they were honoured for their efforts as the club celebrated its 25th birthday. Both were presented with plaques recognizing their 25 years of work in building the club. Both men have been members of the club’s board of directors for the past 25 years and have served terms as president. – Trish Kings, President of the Rotary Club of Brantford. – Robert Caissie, owner of 13 Culligan dealerships & honourary member of the Rotary Club of Brantford. I won my first one on one basketball game there as a kid perfecting Tim Hardaway's devestating crossover dribble, the Texas Two Step in the facility gym during winter. A wonderful facility for youths brought by the Rotary Club of Brant. Reading your story brings back fond memories! Thank you.